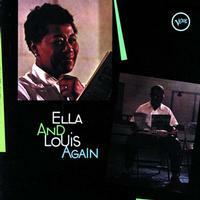 There isn't much one can say about an album whose title is Ella And Louis Again. The "again" obviously means they've already done one album together and beyond that, what can you say about two people like Ella and Louis? I doubt that there's anyone today who loves music, who doesn't know Ella Fitzgerald and Louis Armstrong. The backing, with the Oscar Peterson Trio and Louis Bellson substituting for Buddy Rich, remains, as in the first album, quiet, discreet, swinging. This product is a Hybrid SACD designed to play in both CD and SACD players, as well as all SACD-compatible DVD players. It just doesn't get any better than this. A must-have title for anyone who calls themselves a jazz fan. Audio quality is excellent as well.